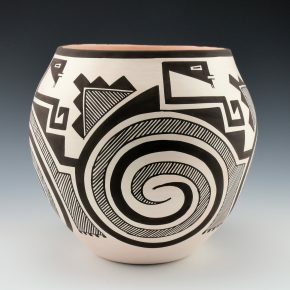 Acoma Pottery and Acoma Pueblo (Pueblo English Pronunciation: "Akk-uh-muh" Traditional Name: Haaku.) Acoma Pueblo is situated on top of a mesa, hundreds of feet above the surrounding land. It commands a breath-taking view of the countryside, other mesas and the distant mountains - no wonder it is called Sky City. Like the hillside towns of Italy, the location was chosen for protection from marauding enemies, but the incredible beauty of this panoramic view of the world must have had something to do with the decision for the Indian people have an intense visual sensitivity, which anyone familiar with their art can easily attest. Acoma, which means People of the White Rock, has been inhabited since before the twelfth century. Most of the present day people have residences in other parts of the reservation or in several farming villages but at no time is the Pueblo on the mesa without several families living in the old houses and caring for the Franciscan mission church of San Estevan, established in 1629 which, with the entire Pueblo has been proclaimed a National Historic Landmark. The ancient cemetery still stands outside the church, surrounded by an integrating wall surmounted by guardian's heads. 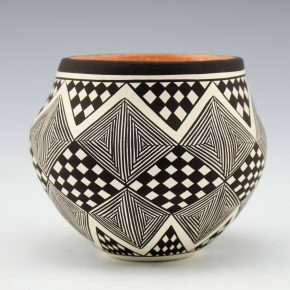 The thin-walled and delicately decorated pottery of Acoma Pottery is among the most prized of Indian crafts. Many fine pieces are on display and for sale in the Visitors Center at the base of the mesa. The Center has a fine museum and features One Thousand Years of Clay, Pottery, and History. San Pedro’s day is celebrated in June. St. James and the Corn Dances of Santa Ana’s day is in July. 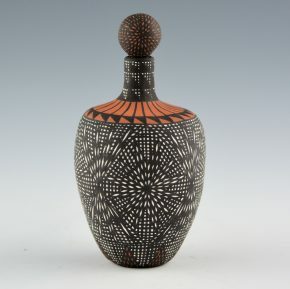 This is a spectacular large jar by Rebecca Lucario. 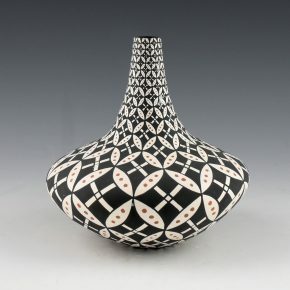 She is known for her delicate and intricately painted pottery. 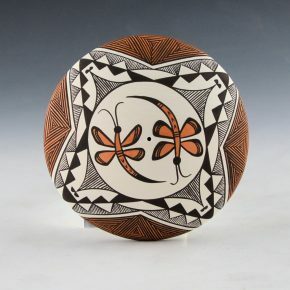 She uses traditional Acoma clay and paints with bee-weed (a plant) and clay slips. Ever since one of her plates appeared on the cover the “Changing Hands” exhibition catalog, her work has become iconic with fine-line and “op-art” style painting. 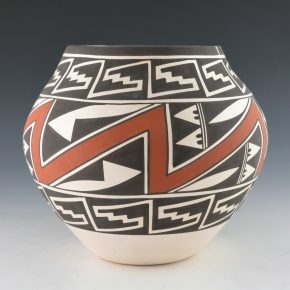 This large jar is a classic Acoma shape with the high shoulder and short neck. 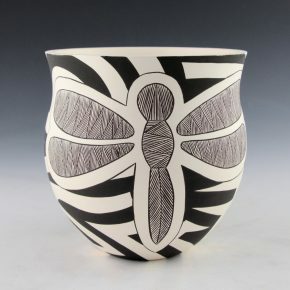 Nearly the entire surface of the jar is fully painted with an interconnecting butterfly design. The design starts small at the rim and the larger at the shoulder and smaller down to the base. Each of the butterflies interconnects and there is a diamond shaped “star” in between. There is simply a beautiful balance of shape and design on this piece. 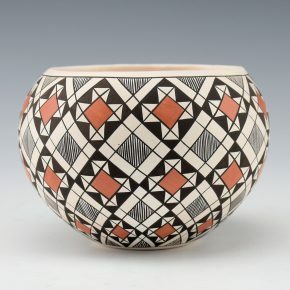 The bottom is the traditional Acoma red clay slip. The jar is signed, “R. Lucario”. It is in excellent condition with no chips, cracks, restoration or repair. 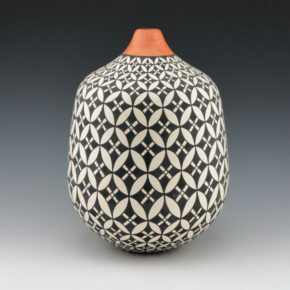 Rebecca Lucario is known for her delicate and intricately painted pottery. This plate is very intricately painted. In the center is a medallion with a parrot. 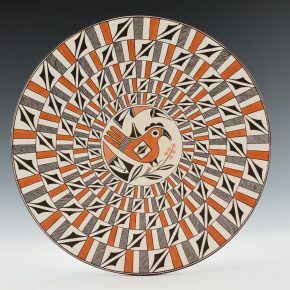 This is a design often seen on Acoma pottery. Spiraling out from this center medallion are wing designs along with rectangular designs of polished red and fine-line patterns. Typical of her work, the lines are very thin and tightly painted. Note how the designs get larger as they extend to the rim. The plate is signed on the back, “R. Lucario”. 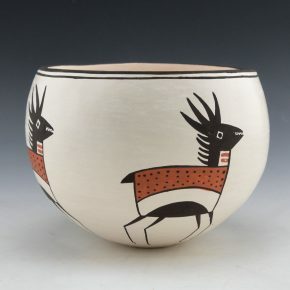 This seedpot by Eric Lewis has a graphically painted deer as the design. He has painted it in a very geometric style which gives it a modern appearance. 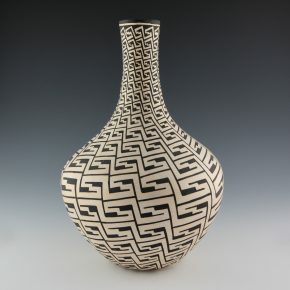 Eric has taken classic Acoma linear designs and made them both bolder and more graphic. 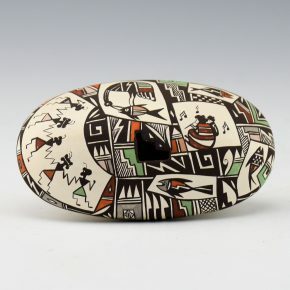 The result is a striking seedpot with tightly painted imagery. 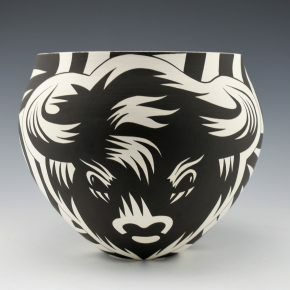 Eric remains one of the young Pueblo potters to watch! 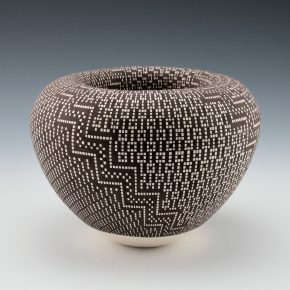 Mike and Jackie Torivio are a collaborative pair known for their innovative pottery. Jackie (b. 1957) is Acoma/Laguna/Acoma and Mike (b. 1958) is from Acoma. They use traditional clay and slips to paint their pottery. Jackie learned to make pottery from her grandmother and mother. Mike only took to making pottery as an adult. Mike forms all the pottery while Jackie paints the very intricate designs. Jackie says she draws inspiration for her designs from the Pueblo traditions she learned as a child. 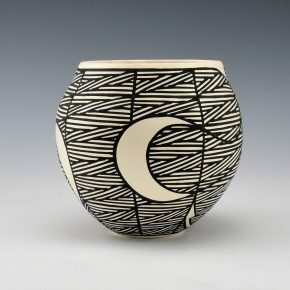 This seedpot is entitled, “Night Protector”. It is in the shape of an owl, with raised ridges along the head. The eyes and beak are slipped with a red clay. The eyes are painted with a spiraling feather pattern. 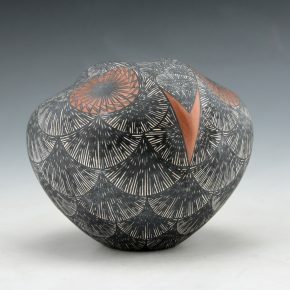 The remainder of the piece is a series of fine-line designs which are meant to emulate the feathers of the owl. It is very detailed in design! The piece is signed on the bottom. It is in excellent condition with no chips, cracks, restoration or repair. 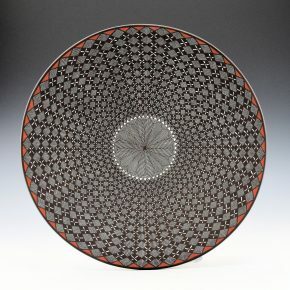 This is a striking plate by Sharon Lewis. 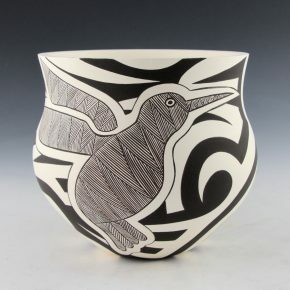 She has developed her own very distinctive style of painted design. Her pieces are beautifully formed, thin-walled and then tightly painted. This plate has a dragonfly in relief on the right side. On the left are two medallions, each with a dragonfly. 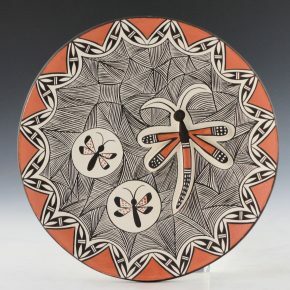 The remainder of the plate is painted with a fineline pattern and the rim has a dragonfly wing design. The red is an additional clay slip. The plate is signed on the back, “Sharon Lewis”. Titus Davis is the son of noted potter Darla Davis and a brother-in-law of Eric Lewis. 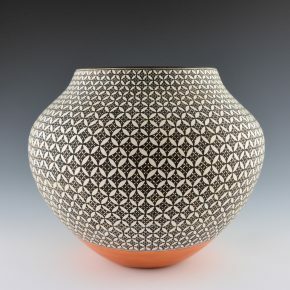 He creates hand-built pottery that combines the classic fine-line designs with a modern approach. This jar has a round shape with a slight shoulder. 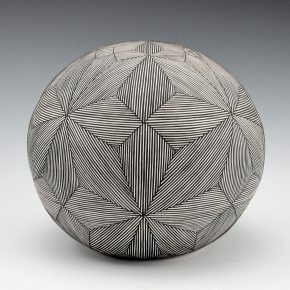 The fineline patterns encompass the surface of the piece. There is a negative space is a series of moon phases. The shape and designs work perfectly together. It is signed on the bottom. 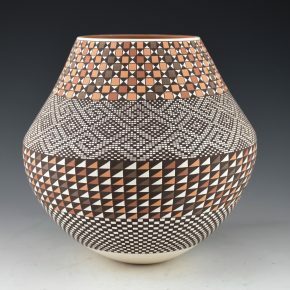 Sandra Victorino is a niece of noted potter Dorothy Torivio. 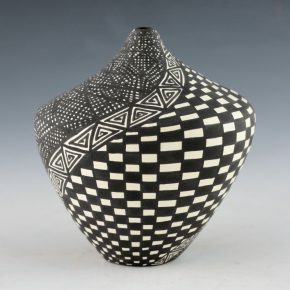 Sandra has her own unique style of “op-art”, where the patterns start small, then get larger and then smaller again on the vessel. 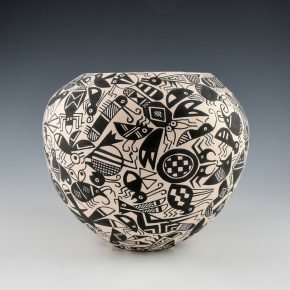 These pieces reflect the variety and intricacy of her pottery designs. 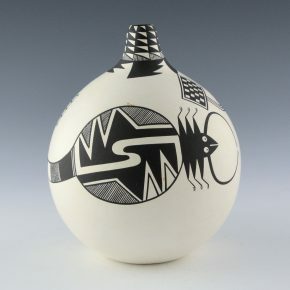 This jar has the white clay painted with the black bee-weed (a plant). The jar has a checkerboard snow pattern swirling down from the rim on one half of the jar. The other half is a fine-line rain pattern. Separating the two halves is an eternity pattern. The intricacy of the designs and the use of the op-art imagery adds to the sophistication of the jar! The piece is signed on the bottom in the clay. Sandra creates a beautiful sense of balance between the form and design. Myron Sarracino is one of the few Laguna potters working today. 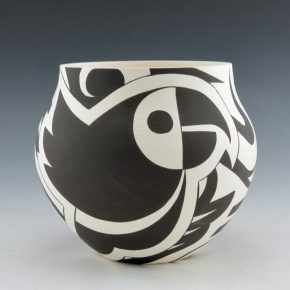 He learned to make pottery from Gladys Paquin and creates pieces which are thin-walled and tightly painted. 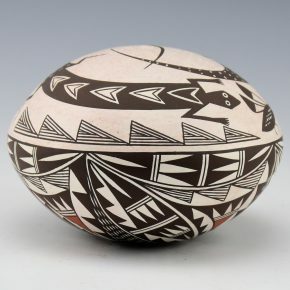 This jar has a high shoulder and a more classic “olla” shape. The design has a “T” shaped could pattern painted with a red clay slip. It is above the terraced mesa design. Below the mesa design is a spiraling water pattern. It has a series of fine-lines painted into the clay. 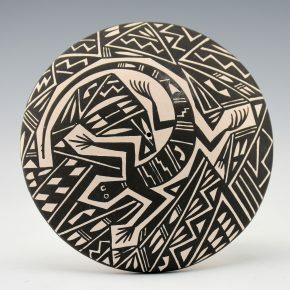 Near the base are plant designs, which are often seen on classic Laguna pottery. The jar is a nice balance of form and design. 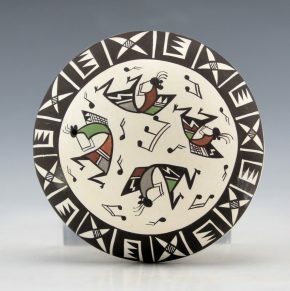 Note on the rim that there is a painted “spirit line”, which is where the “spirit” of the painter is able to leave the piece and it is also a tribute to the potters who came before. 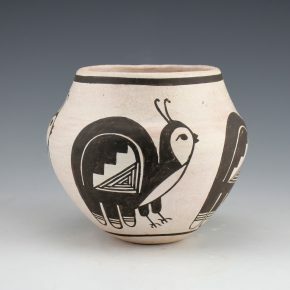 It is seen on much older Acoma and Laguna pottery. The jar is signed on the bottom. Rachel Concho (b. 1936) learned to make pottery from her mother, Santana Cerno. She is a sister of Joseph Cerno and mother-in-law of Carolyn Lewis-Concho. In 2000 she won Best in Show at Santa Fe Indian Market. Her pottery is coil built and painted with bee-weed (black) and clay slips. This seedpot has two lizards and insects on the top. 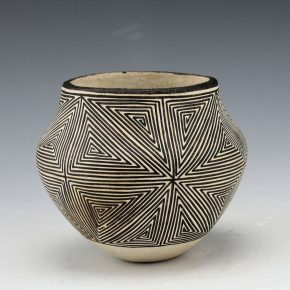 On the bottom has a fine-line star pattern along with classic Acoma rain and lightning designs. 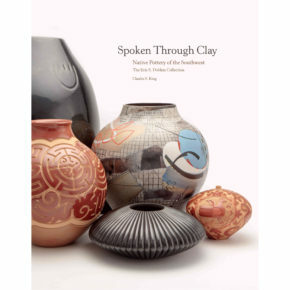 There are accents of red clay slip. It is signed on the bottom in the clay and it is in excellent condition with no chips, cracks, restoration or repair. 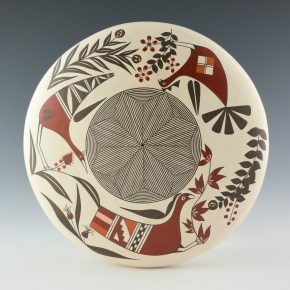 Rebecca Lucario is known for her delicate and intricately painted pottery. This seedpot is painted with a lizard on top. 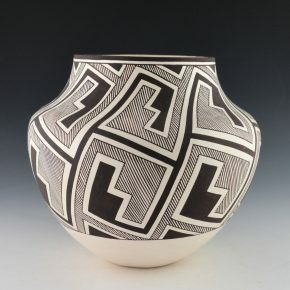 The lizard is surrounded by intricately painted geometric Acoma designs. It is delicate in design and traditional in form. The seedpot is signed on the bottom, “R. Lucario”. It is in very good condition with no chips, cracks, restoration or repair. Sharon Lewis has developed her own very distinctive style of painted design. Her pieces are beautifully formed, thin-walled and then tightly painted. This bowl is thin walled and painted with a series of flowers with red centers. The red is an additional clay slip. 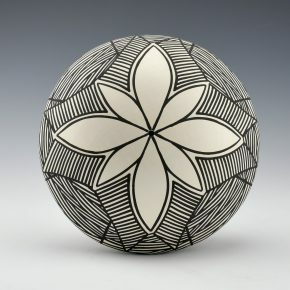 The flowers spiral around the bowl and are separated by fine-line rain designs. 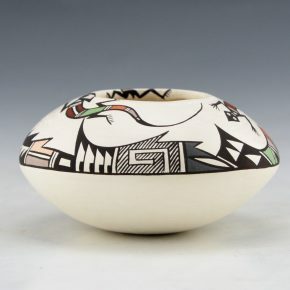 The bowl is signed on the bottom, “Sharon Lewis”. 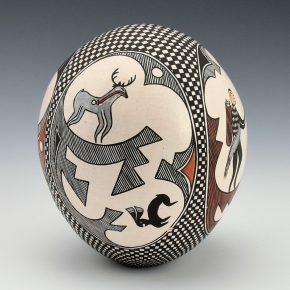 Max Early is one of the few traditional potters working today at Laguna Pueblo. 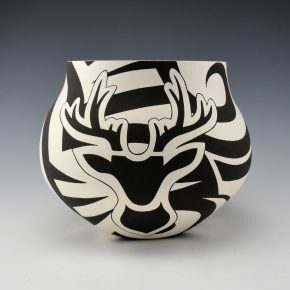 His work combines traditional forms with a blend of contemporary and traditional designs. 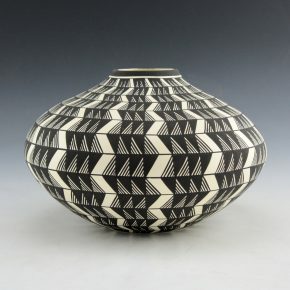 This jar is a traditional shape with a high shoulder and elongated neck. 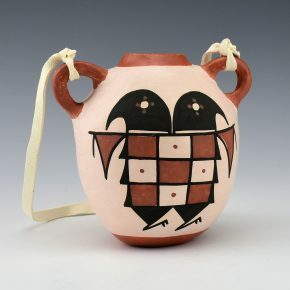 The jar has a rain pattern around the neck and a cloud design around the shoulder. Max noted that these were “older, minimal Laguna designs”. However, as with much of his work, the bottom area is where he created is own additional designs. Here he said he had painted four eagles in flight over the four directional mountains. It is beautiful imagery which complements the simplicity of the designs above. The rounded bottom harkens back to the traditional Laguna pottery when the water jars were meant to be carried on one’s head. Note as well his use of the various clays to create a “three color” jar! 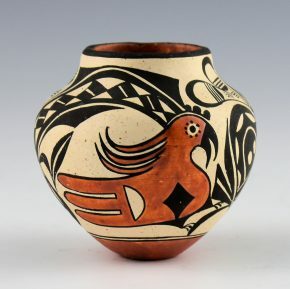 The jar is also traditionally fired, which adds to the overall difficulty of the piece. 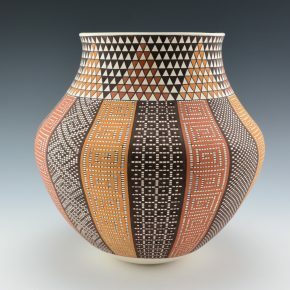 It is certainly exciting to see a potter who is inspired by traditional shapes and designs and yet has the artistry to create his own distinctive variation! 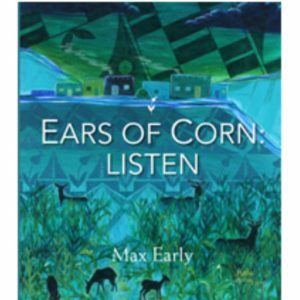 The jar is signed on the bottom and includes a copy of his book, “Ears of Corn: Listen”. 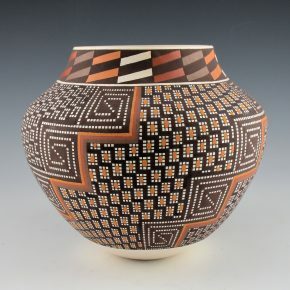 This larger jar by Eric Lewis is a new and more complex design for his pottery. 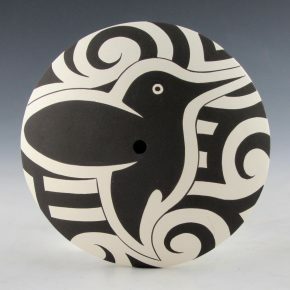 It is a buffalo on one side and stylized birds on the opposite side. The jar has high shoulders and a short neck. The buffalo is wonderfully painted and a bit different from his other more linear designs. 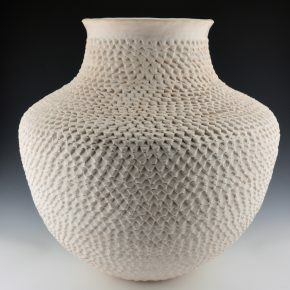 Eric uses his designs to follow the shape of the jar and accentuate its form. 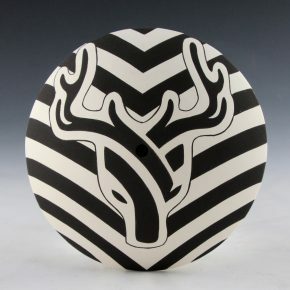 Eric has taken classic Acoma linear designs and made them both bolder and more graphic. The result is a striking jar with tightly painted imagery. 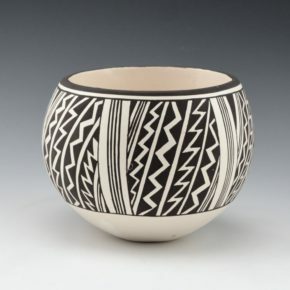 Eric remains one of the young Pueblo potters to watch! 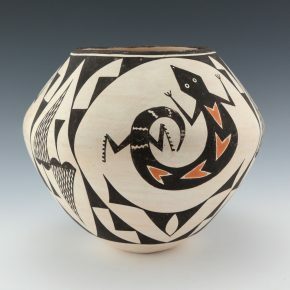 This jar by Eric Lewis has a deer and stylized cloud designs. The jar is round with a short neck. The deer is graphically painted on the front. 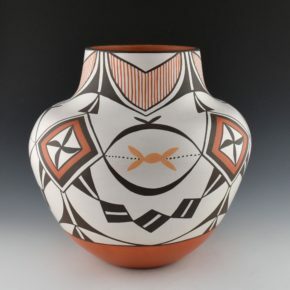 The wide designs encircle the remainder of the jar with cloud and rain designs. 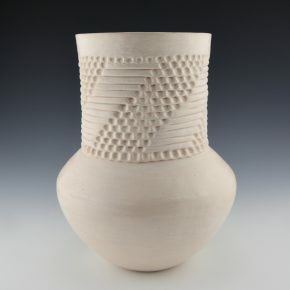 Eric uses his designs to follow the shape of the jar and accentuate its form. 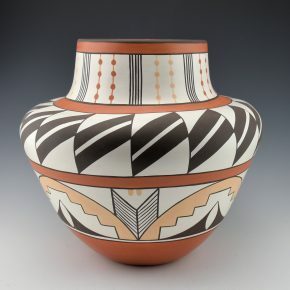 Eric has taken classic Acoma linear designs and made them both bolder and more graphic. 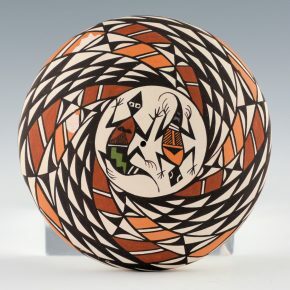 The result is a striking jar with tightly painted imagery. 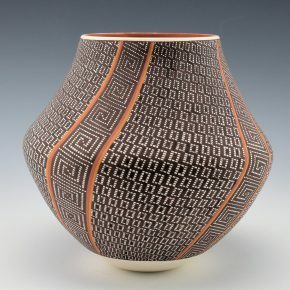 Eric remains one of the young Pueblo potters to watch! 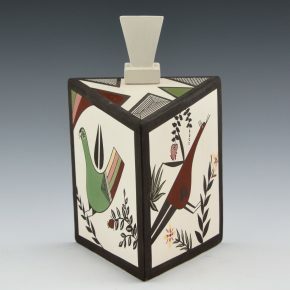 Sharon Lewis has developed her own very distinctive style of painted design. Her pieces are beautifully formed, thin-walled and then tightly painted. 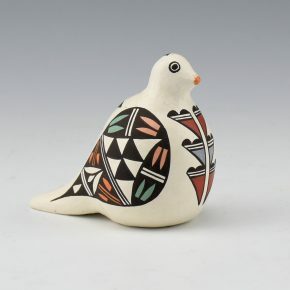 This piece is a figurative quail or bird. The wings on the side and the designs on the front and back are all painted with bee-weed. The colors are all from additional clay slips. The bird is signed on the bottom, “Sharon Lewis”. 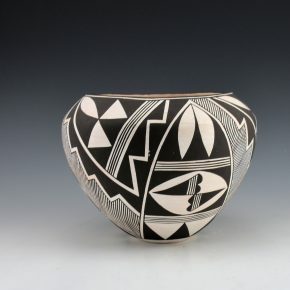 Lucy Lewis is one of the great Matriarch potters of the past century. This bowl is coil built and painted using bee-weed, a plant. The design consists of a triangular mountain, rain and lightning design. 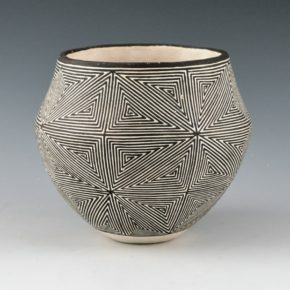 The pattern is repeated around the shoulder of the bowl. 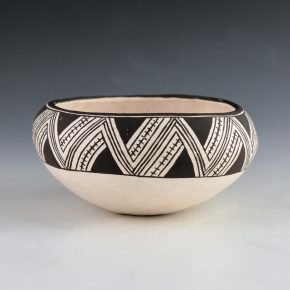 This bowl is thin walled and delicately painted. It was traditionally fired so the white has much more of a pearlescent coloration, which creates added depth. In the 1980’s the surfaces of her pieces were more highly polished, giving them a smoother feel. The bowl is signed on the bottom, “Lucy M. Lewis”. It is in very good condition with no chips, cracks, restoration or repair. Titus Davis is the son of noted potter Darla Davis and a brother-in-law of Eric Lewis. 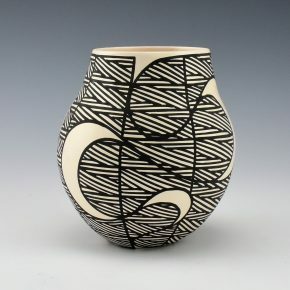 He creates hand-built pottery that combines the classic fine-line designs with a modern approach. This jar has a taller shape with a slight shoulder. There are a series of moon phases as the design with larger moon designs changing into smaller ones. They are surrounded by a fine-line pattern. The intricately painted lines and the open space give the jar a very modern appearance. The shape and designs work perfectly together. It is signed on the bottom. Titus Davis is the son of noted potter Darla Davis and a brother-in-law of Eric Lewis. 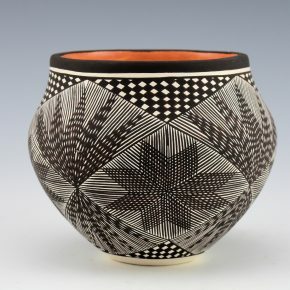 He creates hand-built pottery that combines the classic fine-line designs with a modern approach. 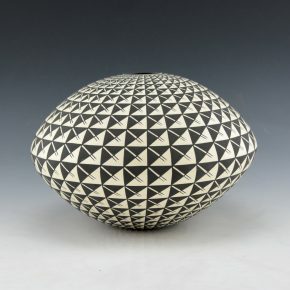 This is the first seedpot of his we have had in the gallery. The piece is painted with a flower design on the top. It is surrounded by traditional fine-line patterns which accentuate the design. The shape and designs work perfectly together. It is signed on the bottom. Sarah Garcia (1928-2015) was born at Laguna Pueblo to Maria Trujillo. However, she spent her adult life at Acoma Pueblo. 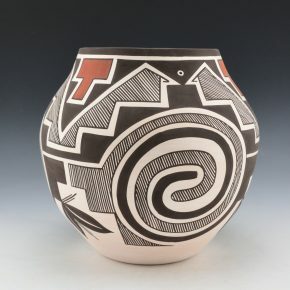 She, along with Jessie Garcia, Lucy M. Lewis, and Marie Z. Chino, were largely responsible for the revival of Anasazi and Tularosa designs on contemporary Acoma vessels. 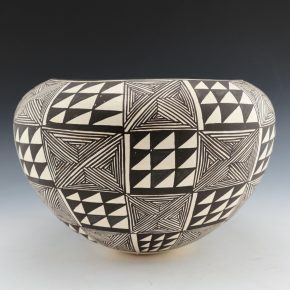 Her daughter Goldie Hayah continues making pottery. 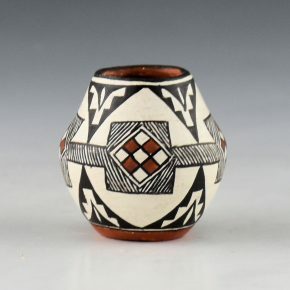 This is a classic style Acoma jar with very tightly painted designs. There are lightning and rain patterns encompassing the surface of the bowl. The bowl is signed on the bottom, “Sarah Garcia”. It is in very good condition with no chips, cracks, restoration or repair. 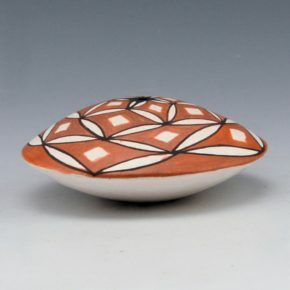 Diane Lewis is known for her tightly painted miniature pottery. 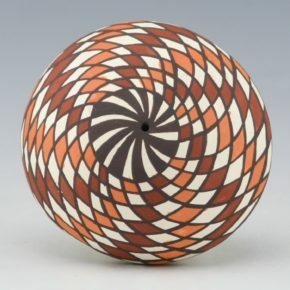 This miniature seedpot is intricately painted with polychrome checkerboard spiral. The hole for the seedpot is in the center and the red, orange and white sections spiral outward. The additional colors are all natural clay slips. 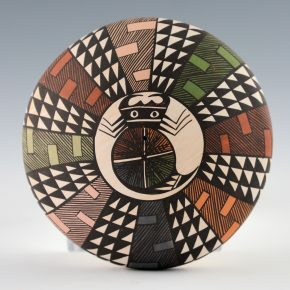 It is an exciting modern interpretation of classic Acoma imagery.